Reversible Kalamkari A-line swing jacket with hand embroidery on both sides. I think this jacket looks even better than its picture in the catalog. I like the fabrics on both sides and the fit is perfect. Workmanship is good too. Beautiful jacket, 2 fabulous fabrics, perfect fit,, & lovely embroidery. Have admired. 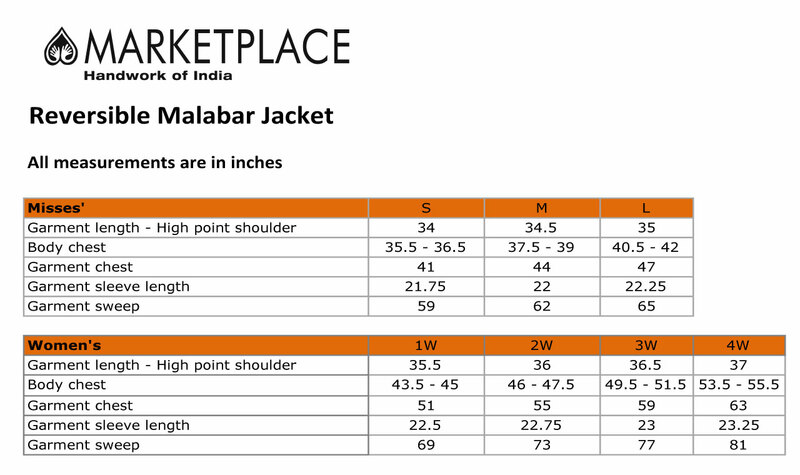 this jacket in catalog for some time & finally succumbed! Thank you. Beautiful material & great quality. I wore it to work to dress up wearing jeans... I have it packed in my bag for the variable temperature in Malta in December.. and plan to wear it over a black dress for some Christmas gatherings coming up.